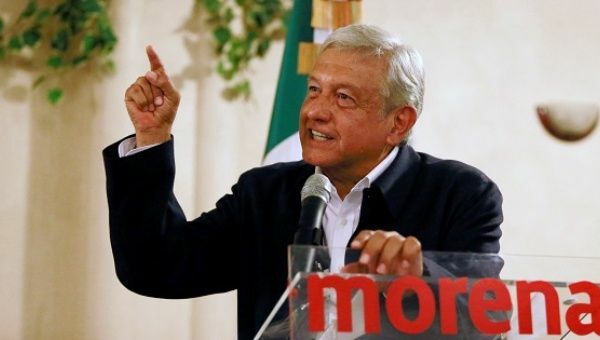 Below is a translation of an article from La Jornada Zacatecas (October 16th) reporting on a speech from Mexican presidential candidate Andrés Manuel López Obrador in support of Napoleón Gómez and Los Mineros. López Obrador visited Sombrerete, Miguel Auza and Rio Grande. Section 201 of Los Mineros in Sombrerete, where this speech was made, has been on strike against Grupo México for over ten years. “Ending the persecution of union leaders, in the mining sector was one of the commitments made on October 14th by the national leader of the National Regeneration Movement (Morena), Andrés Manuel López Obrador, during his meeting in Sombrerete.. Taking advantage of his presence in Sombrerete, a mining town, he said that not only is this change of attitude a commitment of those who fight for justice in Mexico, but he has received requests in this regard at the international level. Also, on the trade union issue, he pointed out that Morena when in charge of the Federal Government would guarantee freedom and democracy within companies with the presence of unions so they do not have ‘yellow unions” but unions which defend the interests of workers. “We will support all the leaders and in particular will guarantee freedom to the mining unions and that if the workers decide, there will always be elections so that the union leaders listen to the workers; so that they are not “charro” leaders who serve only the bosses; so that they really defend the workers and that there is trade union democracy,” he said. On another issue, Andrés Manuel López Obrador spoke about the re-negotiations of the North American Free Trade Agreement (NAFTA), which are currently underway. Thanks to Ben Davis of the United Steelworkers.